8:00pm – 2:00am Paradiso Presents! On March 30th, 1968 ‘Cosmic Relaxation Center Paradiso’ opened its doors. The goal was to offer an open place for creative talent. 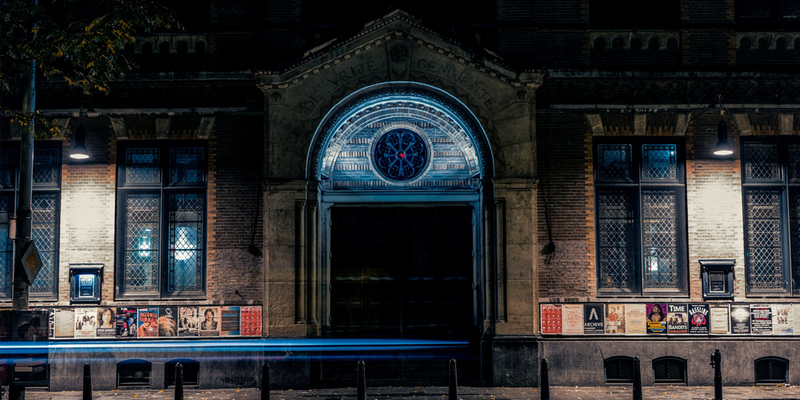 From this day, the church building on Weteringschans was a place that attracted youngsters, audiences and artists from Amsterdam, The Netherlands, Europe and the rest of the world. In the 50 years that followed, Paradiso has become a pop venue, a club and a cultural center in one. On wednesday March 15, Paradiso hosts the evening/night program in the New Dutch Wave House, with many young and established, national and International artists! Canshaker Pi plays garagerock that rattles, rumbles and does not color within the lines, like Pavement and Teenage Fanclub did. In 2016 their untitled debut, produced by former Pavement front man Steve Malkmus, was released by Excelsior Recordings. This was celebrated in a full Oedipus brewery, followed by gigs at the Lowlands Festival & the Great Escape and a European club tour. Things have been going well for the Utrecht-based folkband Rosemary & Garlic. Spotify streams are running into millions since their EP debut that was released in 2015. Last January they released their untitled debut album. Straight outta Bijlmer, meet Ray Fuego. Born as Rayvel Pieternella he quickly made himself known to the world with a punk infused hip-hop and rebellious attitude. In 2014 he released his EP Bummy Boys and nearly set the Internet on fire with his uncensored videos. Not shy of using too many curse words or some controversy, Ray soon became the new Dutch hip-hop sensation, playing big festivals like hip-hop hub Appelsap. British jazz alto-saxophonist and mc Soweto Kinch, is a fascinating and promising young musician in both the jazz and hip-hop scene. He already won two MOBO Awards, two BBC Radio Jazz Awards and was nominated for the Mercury Music Prize (though lost against Dizzee Rascal). As a producer and mc, he is well respected in the hip-hop scene for backingup KRS ONE and received a lot of support for his rap battles at Don’t Flop Entertainment. In 2014, barely old enough to order a beer, the first EP of The Homesick came to life. From their hometown Dokkum, they quickly concurred the Dutch music scene. Puberty and Internet formed the motive for the youthful trio at the time. It led to the playful ‘Twst Yr Wrsts EP’, released by Subroutine Records. Since the release of this first EP three years ago, their pop has developed into something more daring, noisy and experimental. A big tour with Rats On Rafts- and later many festivals followed. Now, three years and hundreds of hours on stage later, there is the long-awaited debut ‘Youth Hunt’: noisy pop songs that take unexpected turns. Growing up in a rural region seeps through, but The Homesick is more wayward than ever. Joost van Bellen is a phenomenon. He is a creative centipede, a discodinosaurus and a chameleon. But those who follow his thirty-year career will see the general divisors: beyond his love for the night and contrarian cultures, Joost still feels the urge to renew himself, to entertain people and at the same time to give them something to take home. Van Bellen was born in 1962, his favorite crede is Forever Young! He is known as a DJ and party organizer, but is also infamous as a creative- and musical director for high end fashion shows. His taste for music is inimitable and diverse, his DJ sets are innovative, festive, powerful and (just like the man himself) cannot be boxed in one category. Joost follows paths that are not always the easiest. ‘I always seek for adventure, and if that adventure eventually works out, it was the right decision, and at that moment it gives me, just for a little while, satisfaction from the work I do,’ he once said in an interview. In 2010 he decided to write a novel, that book came out four years later. The rest is history that has yet to be written.